A judge is a person who is in control of a court of law. The way to become a judge depends on each country. In some countries, judges must work with the law (often as a lawyer) for a number of years before they can "sit as a judge" in a courtroom. Juries are used in many countries, but not for all cases. The modern jury trial first developed in mid-12th century England during the reign of Henry II. Today. the details differ between one country and another. If there is a jury, the judge has the job of making sure the person taken to court is treated in a fair way. Some courts will have more than one judge. For important decisions about the laws of a country, countries may have a supreme court or high court with many (nine or more) judges in it. In the United States, judges on a supreme court are called justices and are lead by a chief justice. In many countries, judges wear special clothes while being in court. Often this is a black robe or cloak. Supreme or High Court judges often wear a red cloak. 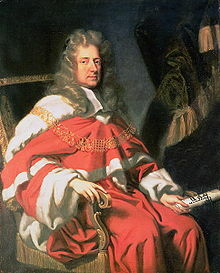 Judges in some countries also wear a special long wig. They also used to put a piece of black material on their head when they sentenced a person to die. This page was last changed on 19 August 2014, at 11:14.